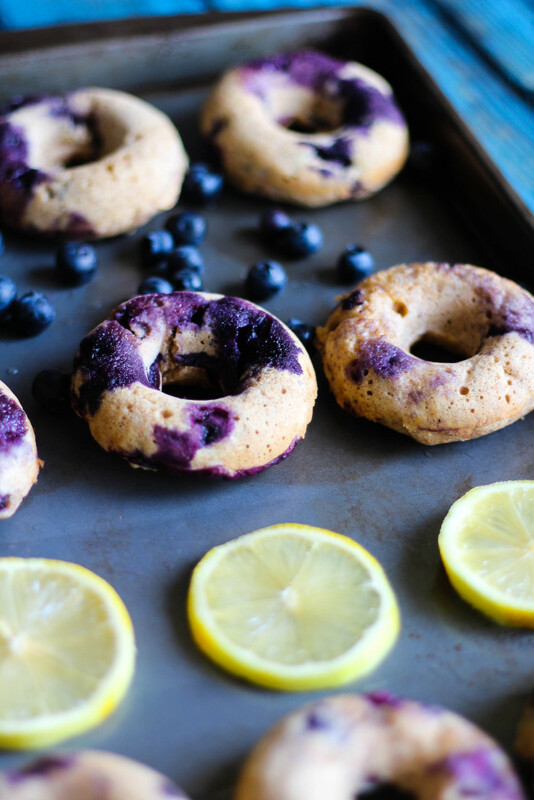 Blueberry Lemon Donuts for your Sunday breakfast desires. This combination of sweet and tangy make for a flavor burst you’ve always wanted in a donut. There is something so satisfying about a donut. So, I’ve found my way around eating traditional, fried donuts, except for the occasional slip-up at Sunday mass when our church has free Dunkin Donuts… What the heck, am I supposed to pass that up? No. The answer is no. You always donut if presented the opportunity, at church no less! I love the combination of blueberry and lemon. Blueberries can be so sweet and tangy at the same time, and of course you’ve lemons, the ultimate sour citrus. They complement each other so well, especially in a donut. 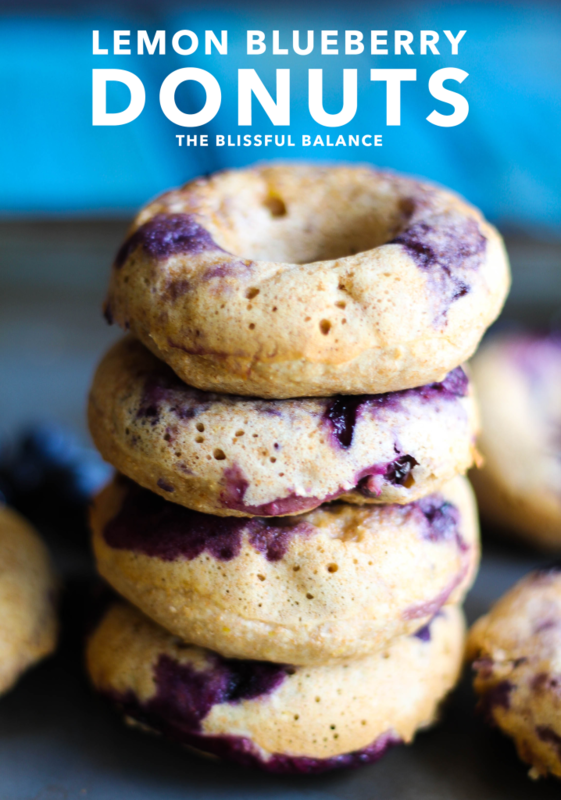 I didn’t use any butter or any oil to make these donuts, so they are the perfect treat for those of you whose stomachs can’t handle unhealthy fats. I love substituting Greek yogurt for butter and/or oil. It creates a whole new flavor profile and not to mention, it makes for a way softer, more moist texture. 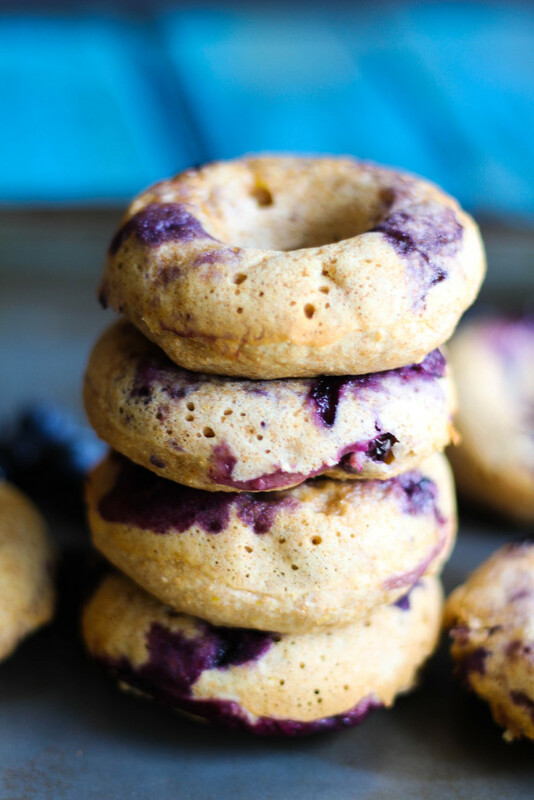 Replace butter with Greek yogurt in these Blueberry Lemon Donuts! Something I absolutely loved the instant I pulled these out of the oven, was the bursts of purple from the blueberries. It’s almost as if I accidentally made tie-dye donuts. No, I mean… I [on purpose] made tie-dye donuts. Every bite is full of blueberry flavor explosions. Just how I like it. Nuked in the microwave + Cool Whip on top. Eat them this way. No other way but this one. Yep. Pre-heat the oven to 425 degrees and grease a donut pan. Combine the wet ingredients in a large bowl. Add in the baking powder, baking soda, sugar, and lemon zest. Stir until well-combined. Add the flour into the mix in batches, while stirring. Spoon the batter into each donut mold. Bake for 5-7 minutes, depending on the strength of your oven. When a knife comes out of the donuts clean, they are finished. Do you have any tummy troubles that you ignore at times because you just really want that one treat!? If you liked this recipe, be sure to pin it for later! Those are two of my favorite flavor combos and those look so good! 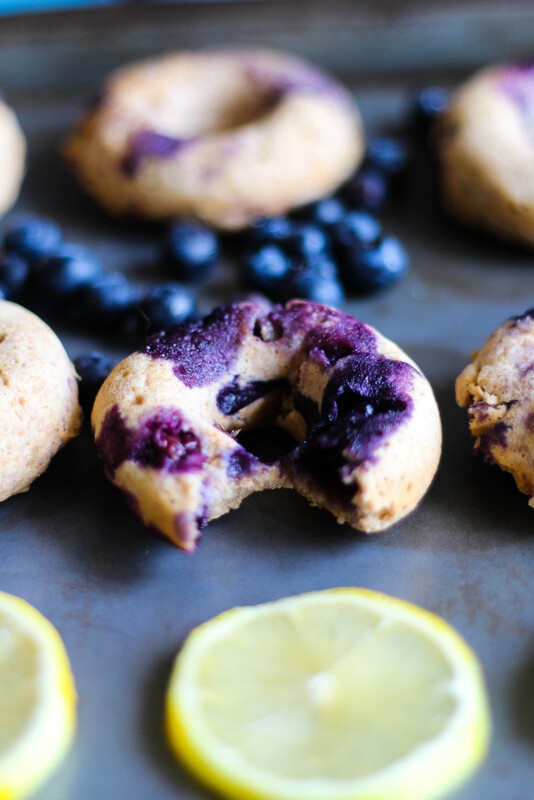 Blueberries and lemon are a delicious combo. I loveee the way baked blueberries look. SO pretty! Right? They exploded!!! So good! I’ve never been crazy about donuts unless they are blueberry and then I can’t stop myself. Lemon is also my all time favorite flavor so maybe it’s fate. I haven’t made my own especially not in the oven, but that makes it sound much less intimidating! You can also tell that they’re not too oily and they sound the perfect amount of sweet! Sorry to hear about your flight woes, I’m glad your back safe in Tampa! Thanks girl!! And yes it’s one of my favorite combos. It’s so easy to bake them I recommend getting a donut pan! I got mine at bed bath and beyond. Haha!! That’s the goal! ;D Thanks girl! Oh I am so with you on loving all the donuts! Every time I go to a new city I always want to find a cool donut shop haha. These look delicious and I am putting a donut-pan on my list of things to get! Oh that’s totally a great thing to look for!! We’ve got some good ones in Tampa that I’ve yet to try. What is wrong with me?!? Thanks girl!! My church always has coffee and donuts every sSunday and it’s so hard for me to not get a donut so every once and a while I will sneak one because they just smell so good! I love baking donuts in the oven especially since I have an awesome donut pan that I got last Christmas. I adore the lemon and blueberry combo you’ve got gong on here, its so delicious and these would be amazing dunked in coffee! YES seriously that’s how I am lol! You’ve got to use that donut pan it will change your life! Gorgeous, and no doubt delicious. 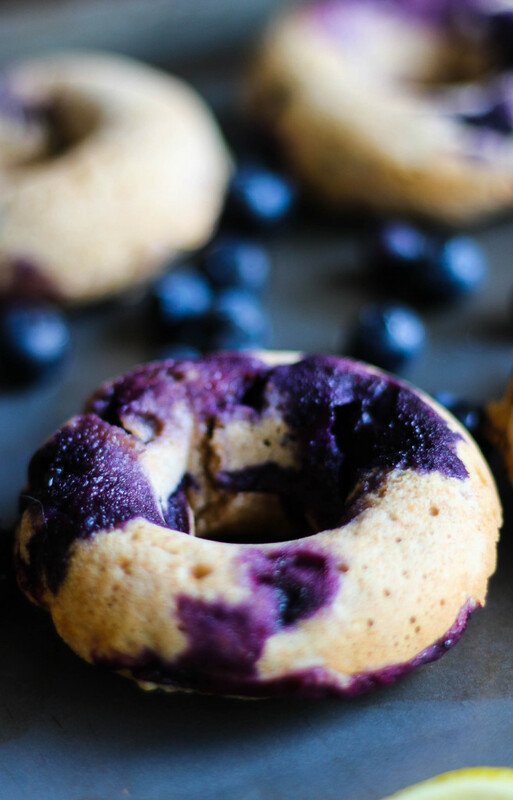 Love blueberry and Greek yogurt together—perfect paieing! oh em gee. literally mouth watering! blueberry gorgeousness happening up in hurr. This is such a blogger thing to say, but I just can’t get over your photos. Love them. I think I need to get myself a donut mold, although that might be dangerous! Haha!! Thank you so much Sarah! Ahhhh I wish I was my 6 year old self again and I could eat donuts like it was my JOB. Now they make my stomach feel like it’s dropped to the ground! But I have hope with these beauties! Would white whole wheat flour work as a sub for the plain whole wheat? oh I know what you mean haha!! And yes I believe so! Just keep an eye on them as they bake. These look AM-MAYYYY-ZING!!!! Feed me! Plus your pics are totally gorgeous! Look at that color! 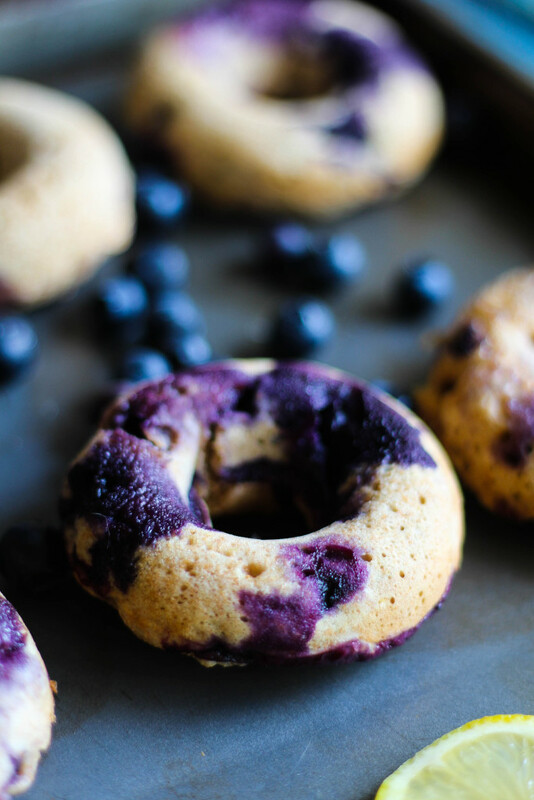 The blueberries make these donuts looks gorgeousss! Blueberry flavor explosion?! Wow! That sounds amazing! …and these look beautiful!! What a pretty recipe Thanks for sharing!! Cailee recently posted…Friday Food Review! When blueberries are in season (like basically you can get a carton for like free) I make blueberry lemon EVERYTHING. Love making scones and bread but have never attempted donuts! Until now. These look SO amazing. And cake donuts are my fav – the texture of these reminds me of cake favsies. YUM!!! Okay, now I NEED a donut pan to make these bad boys. I’ve always got some blueberries stocked in the freezer! I NEED to make these! I never pass up an opportunity to eat donut :). 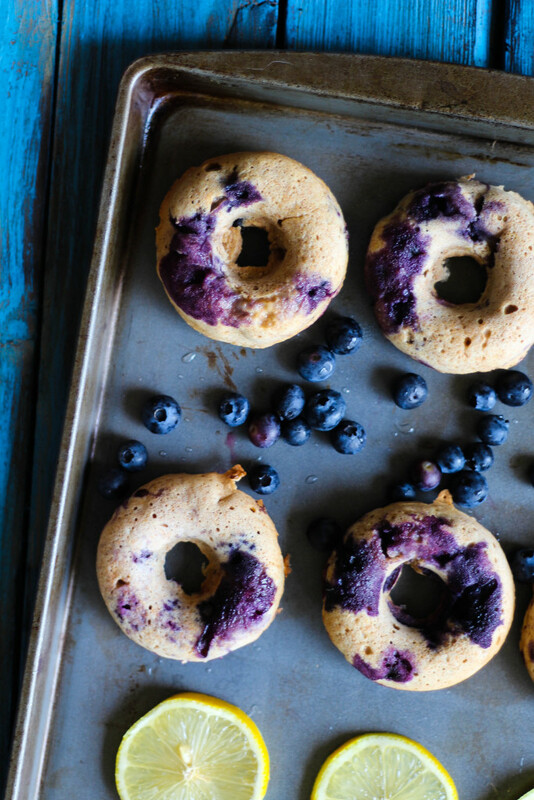 These are the perfect excuse to use my donut baking tray! Lemon and blueberry are one of my favorite pairings!! I think I’m convinced to get myself to buy a donut pan. loooove the pop of blueberries — cant wait for berry season to make them!! I bought a donut pan yesterday and I went straight for this recipe this morning! Delicious! I used frozen blueberries and it worked out great, just in case anyone else was wondering!